The year 2007 in the Film Industry has been a topsy-turvy one to say the least. We’ve had surprises, we’ve had disappointments. We’ve had massive successes and we’ve had unprecedented failures. But one thing’s for sure – we’ve had variety. And it is this variety that makes the Indian Film Scene such a magical land for viewers all over the world. Yet, it is the Film Scene’s sister Industry, its music, which seems to have benefited the most from this diverse landscape of cultures, artists, and flavors. As I’ve mentioned in earlier years, music always seems to find a way to replenish itself. Genres are re-invented and talents are re-discovered. 2007 has etched its place in India’s rich heritage of auditory excursions, acoustic fields, and progressive sounds – and it is my pleasure to present you with the very best that 2007 had to offer. Following are what this writer believes to be the top 15 soundtracks of the year, with credits and highlights of each. Also, please feel free to click the album title to read our full review. I am just as surprised and disappointed as you are to see this soundtrack appear at the beginning of this year’s list. This was, hands-down, my most anticipated soundtrack of the year. Sanjay Leela Bhansali and Monty Sharma have hooked-up on previous occasions to create aural splendor in the background scores of previous musical masterpieces such as HDDCS, Devdas, and Black. Although the soundtrack boasted of an impressive line-up by Monty, the sheer expectations are what did this soundtrack harm. Composing an unprecedented eleven songs for Saawariya, Monty creates some melodies that are as magical and fairy-tale like as the film itself. You know you have a winner on your hands when four different critics will give you four different favorites – be it the youthful title track with an award-worthy rendition by debutant Shail Hada, or the romantically written Jab Se Tere Naina; be it the timidly beautiful Thode Badmash sung angelically by Shreya Ghoshal and composed by Bhansali himself, or the traditional, yet tasteful, Yoon Shabnami. This may be the least appealing musical product by the SLB-Monty duo, but when that is good enough to make #15, you know the potential is ridiculously high. The fact that Rabbi Shergill was signed on to compose for his first film score raised many brows. This 32 year-old musician landed the scene with his chart-topping debut album Rabbi, in which he proved his competencies as not only a composer but as a lyricist as well. Delhi Heights was a true success for Shergill, as he brought sufiana, folk, and light-rock sounds together – an amalgam that would otherwise elude Indian music lovers. Tere Bin is a lyrically, melodically, and musically soulful track which was featured in Shergill’s debut album. The folksy feel continues with another wonderful composition in Kitni Der Tak, which has layers and layers of sounds and appeal. Kailash Kher shines in the animated Ae Gori (Holi) while Dilli is a relaxing sensation in its own right. Kabhi Aana Ho is the one track that pales next to the rest. After experiencing his debut album, there was no doubt the man would stay and thrive; but now after listening to Delhi Heights, I’m proud to say he’s got a whole new career on his hands if he wants it. 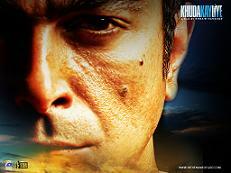 Dus Kahaniyaan is a pioneering attempt to break cinematic and musical norms. However, the will to tread newer grounds is more successfully achieved in its music than through its multi-narrative cinematic attempt. The idea of separating a soundtrack into two CDs (usually Club & Lounge Mix) is a trend that caught on after Musafir’s soundtrack released back in 2004. DK goes one step further and adds a poetic touch…literally. Gulzar has written some fantastic poetry in the third CD which is rendered by the film’s cast. Over on the other CDs, the music isn’t too shabby either. Of the four contributors, Anand Raj Anand (who seems to be doing no wrong as of late) comes up with the two best tracks: Bhula Diya (self-rendered) and Bin Tum (rendered by K.K.). The close third place would have to be given to Gourav Desgupta’s Aaja Soniye, which has a wicked hook-line by the chorus. The soundtrack of DK is one that may take time to grow on you, but I guarantee that the heavy club beats will find their way into your soul, while the tender melodies will carve themselves a place on your lips. The film may have been one of the biggest flops of the year, but its music sung a different song. Aggar is Mithoon’s sophomore attempt, and although it faltered next to his earlier release in The Train, it had some very foot-tapping and melodic numbers, including Ke Bin Tere, Paas Aaya Kyon, and Seher. Lyricist Sayeed Quadri puts the finishing touches on Aggar in making it a must-hear! The one knock I have on Aggar, and Mithoon’s work in general, is that he tends to reuse a lot of his melodies with little variation. Let’s just hope he hasn’t burnt himself out already! Vishal-Shekhar have had some high-profile projects this year, none more so than Om Shanti Om. The hip-hop fakers bring their A game with this soundtrack, which is a true illustration of what I meant when I said diversity rules on the music scene. The one track that seemed to get the most attention and praise was Ajab Si, a romantic piece like none other, rendered with supremacy by the one and only K.K.. Daastaan-E-Om Shanti Om will put an eerie chill down your spine, while Rahat Fateh Ali Khan’s sorrowful vocals breathe new life into Jag Soona Soona Lage. If that isn’t enough variety, then take a listen to the ever-so nostalgic Dhoom Tana composed by 70s great Pyarelal (yes, you read it right)…or perhaps you’d like to dim the lights and take a romantic stroll through Main Agar Kahoon, which has to go down as one of Shreya Ghoshal’s and Sonu Nigam’s greatest duets. Vishal-Shekhar come back strong with their best work since 2004. Jab We Met was full of surprises! Not only was the story a sweet and successful one, Pritam shows his playful side with the music of JWM. Of course there is vintage Pritam in the high-flying Punjabi track Mauja Hi Mauja rendered by Mika Singh; but there is also the soulful and poetic Pritam in Tum Se Hi rendered by a personal favorite of mine, Mohit Chauhan. Yeh Ishq Hai shines a naughty, yet groovy and addictive, light on Shreya’s vocals, while Aao Milon Chale showcases Shaan’s prowess while he renders the breezy melody. Sandesh Shandilya, who started his career of on a great high (Kabhi Khushi Kabhi Gham & Chameli) makes a syrupy sweet guest composition with Ustad Sultan Khan, which has been beautifully mingled into the screenplay of the film. But oh wait, we are talking about Pritam right? So we should ask the question – is it original? Aao Milo Chalen is in fact a blatant copy of Indonesian band Peterpan’s track Di Belakangku. Let’s recall that Pritam ripped his earlier track Kya Mujhe Pyaar Hai (Woh Lamhe) off of Tak Bisakah – a track belonging to the same album! You know, I thought that after being publicly called out for his illegal acts the man would have no choice but to return to fair means. I guess I was wrong. Thanks to Itwofs.com for the leads. It’s no doubt that Johnny Gaddaar, the film, has had a great run, but Shankar-Ehsaan-Loy’s smashing music breaks grounds as well, as they come together to bring us some rocking beats and wicked instrumental pieces. The electrifying tracks seem to be a perfect complement to the thriller. Be it Shankar Mahadevan’s tricked out vocals in Move Your Body, the nostalgic/acoustic riffs in the various renditions of the title track, or the quasi-trance number Dhoka. And to top it off we have a perfect tribute to the yester-years in Bhule Bisre Geet. 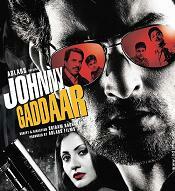 Johnny Gaddaar is anything but your average film or soundtrack. SEL succeed in re-defining themselves and maintaining the edge over their counterparts. Khuda Ke Liye is an exception on this list. See, I hate to be bound by conformity…that’s why I’ve decided to expand the conventional top 10 list to 15. Likewise, Khuda Ke Liye is a Pakistani Film, not Indian. 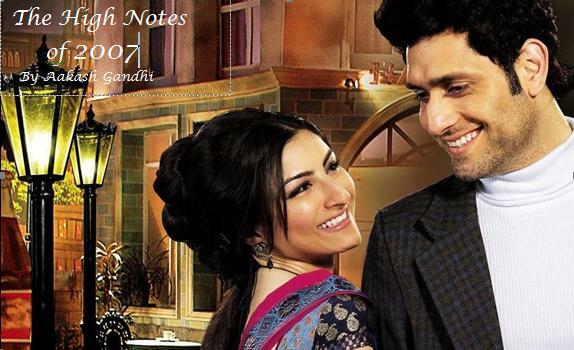 However, the film and music were officially released in India. Besides, the music is too damn good to not put on this list. Khuda Ke Liye has some soul-soothing numbers that I’m sure everyone will love as soon as they give it a listen. It’s so difficult to pick favorites, but they would have to be Bandhe, Kamod, and Khuda Ke Liye. The sounds and melodies of Pakistan are truly breath-taking, and they offer the perfect balance with Indian Music. I for one am proud to be able to have the best of both worlds. Click on the link above to access the full review, where you’ll find detailed information on the original credits of each track. Awarapan is ground-breaking in that Pritam has actually credited the original artists of each track! The original tracks are all fantastic to begin with, but Pritam should be given credit for doing a phenomenal job in recreating the tracks, while harnessing their original beauty, and even adding to it! The most deserving track is Toh Phir Aao, originally composed by Pakistani band Rox3n. Needless to say, Pritam has re-designed the piece with a whole new look. The result is nothing short of a masterpiece – and could quite easily be the greatest song of 2007. The other tracks, including Tera Mera Rishta, Mahiya, and Maula Mere Maula walk along similar lines as Toh Phir Aao and are all deserving of your attention. See Pritam, only good will come of abiding by rules and giving credit where credit is due. Working with a perfectionist is no easy task, yet Shankar-Ehsaan-Loy pick up right where they left off in Johnny Gaddaar to compose an outstanding soundtrack for Aamir Khan’s special directorial debut. If anybody can put tears in your eyes, it is Prasoon Joshi’s unequaled emotional words in songs like Maa and Taare Zameen Par amidst the caressing arrangements of SEL. Just as beautiful as the film itself, SEL comprise a group of songs that capture not only your hearts, but the innocent world of children and the joys that pervade their universe (i.e. Bum Bum Bhole, Jame Raho, and Bheja Kum). If it were anyone else, their efforts may have paled next to the masters of SEL…but not Shailendra Barve. His guest composition, Mera Jahaan, rendered flawlessly by Adnan Sami, again captures the essence of children and the pressures that are placed upon them. And of course, Prasoon Joshi is the unsung hero who’s symbolic, simple, and emotional words bring soul into music. 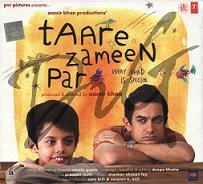 All in all, Aamir Khan could not have asked for a more fitting and rewarding soundtrack. Mithoon’s name first came on the scene with his rhythmic and addicting re-creations of popular Pakistani tracks Aadat and Woh Lamhe. It wasn’t until 2006 when he finally showed us what he’s really made of by composing his first original tracks in the soundtracks of Bas Ek Pal and Anwar. The young man of just 22 years was sensational! And it was early 2007 when Mithoon blessed us with his full-fledged debut in The Train. Needless to say, coming in at #5, The Train is a special soundtrack which encapsulates sounds of rock, pop, dance, and acoustics. If you ask me my personal favorite, it would be the K.K. rendered Beete Lamhe – rarely do I hear a song with so much soul, passion, and emotion…not to mention K.K.’s award-worthy performance. The Train has some treasured tracks that can fit almost any and every mood, including the wildly popular Mausam and Woh Ajnabee. Quadri’s poignant and moving words are another feather in the man’s decorated cap. And although Mithoon had a slight drop-off in his sophomore attempt, Aggar (coming in at #12), the man has done an outstanding job outside the Film Industry in tracks like Kucch Is Tarah (for Atif Aslam’s Doorie) and Ek Shaqs (for Abhijeet Sawant’s Junoon). Here’s wishing Mithoon a very prosperous and wildly successful career ahead! If you ask any music critic – LIAM is arguably Pritam’s best work to date. Not only does each and every track maintain its own identify and flavor, they all do nothing but entice, enthrall, and seduce. In addition, Pritam introduces his listeners to a very youthful and talented array of up and coming singers, including Suhail Kaul and Soham Chakraborty, who are absolutely ravishing in their work in tracks like In Dinon, Baatein Kucch Ankahee Si (Unplugged), and O Meri Jaan (Reprise). From flashy and catchy melodies right down to their engaging and animated arrangements, each track of Metro is deserving of attention and praise. But let’s not forget, we are talking about Pritam…so which track(s) have been stolen? Baatein Kucch Ankahee Si’s title melody has been taken note for note from famous 70s Korean artist Seo Yu Seoki’s track Ah Reum Dah Oon Sa Ram. To a much lesser extent, there are slight similarities between the melodic structure in the opening line of In Dinon and Amir Diab’s Ba’ed El Layali. However, we’ll give Pritam the benefit of the doubt on this one. Thanks to Itwofs.com for the leads. Verdict: Life In A…Metro is an absolutely gorgeous soundtrack that has all the trimmings of being a classic for the young romantic couples out there. Of course on a critic’s list of top soundtracks (or on my list at least), it’s almost certain that the majority of readers will not have given much attention to the top three picks – possibly because the smallest of details and nuances that make these soundtracks special can easily go undetected by the casual ear. Unfortunately, I fear this year will be no different. 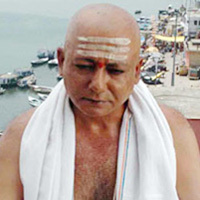 Dharm is a film that many critics believe to be the best film to come out of India in 2007. However, many have overlooked the voice of the film…its background score if you will. Just as the score of BLACK brought soul and voice to the characters on screen, Dharm does the same. Debojyoti Mishra, whose earlier work in Raincoat was nothing short of masterful, composes each piece with a keen ear for detail – utilizing traditional instruments and vocals that synergistically bind together to scream volumes on screen, while appeasing the gentlest of musical senses on audio. Anything but a conventional soundtrack, of Dharm’s twenty tracks, only five are full-fledged songs, including Silence rendered ever-so beautifully by Aanchal and Sayeed Ambrish, Piya Bole sung immaculately by Sonu Nigam over some fantastic eastern arrangements, Piya Bole by Shreya Ghoshal with her unequalled touch and passion, Dharm, and Bhaee Bhor, both of which highlight the true essence of Dharm’s message. The highlight of Dharm’s score is undoubtedly Sonu Nigam’s veteran vocals that play an important role in many of the songs and thematic pieces. Verdict: Dharm’s score is a meditative and peaceful realization of what the film aims to convey and is a prized possession on the shelf of any true Indian Music lover. Not only was 1971 an extraordinarily riveting film that I feel didn’t get its due credit, but it also entails a truly remarkable soundtrack by debutant composer Akash Sagar. Comprising of three brilliantly orchestrated songs and four even-more expressive thematic pieces, 1971’s music serves as a vivid reflection of the pain and hope felt by the characters of the film. Kailash Kher’s Bhangra Pauna is a wicked percussion piece that has been poignantly composed by Sagar to express the optimism and unity the POWs faced in the midst of peril and despair. Harshdeep Kaur’s rendition in Saajana is nothing short of stellar, as the unique track with Punjabi influences speaks on the sorrowful separation between a country and its estranged soldiers. 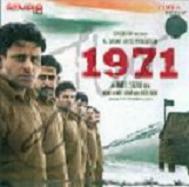 Arguably the greatest piece of 1971 and one of 2007’s best is Sehlenge Hum sung by veteran Shibani Kashyap. Sagar’s sorrowful orchestration, coupled with Kashyap’s grief-stricken yet beautiful rendition make for an overwhelmingly moving piece. Verdict: The majesty with which this elegant and touching score has been composed escapes the boundaries of written words – listen to it, feel it, experience it. Just like 1971, KKC is another fascinating piece of cinema that went virtually unnoticed by the masses. Just when you thought Shantanu Moitra was losing momentum (2006: Lage Raho Munnabhai. 2007: Laaga Chunari Mein Daag) he comes out with KKC – a stunning revelation of exotic sounds that breaks through barriers of time and culture. Moitra takes us back half a century with classy, yet authentic, Big Bang numbers like Khushboo Sa and Yeh Nigahein. He breaks genres by creating a semi-classical ambiance in my personal favorite, Sakhi Piya. Yet, he is able to keep your foot-tapping with a melodically rich and rhythmically soothing title number. Although KKC is undoubtedly a masterpiece of sorts, it may not get the wide-spread recognition that Moitra received for his brilliant work in Parineeta – another masterpiece of sorts. Why? Perhaps because KKC’s nuanced quality isn’t as obvious to pick up. Moitra has embedded a lot of heart and thought in his compositions, and they may take time to grow on you. As I always say – the greatest of triumphs are determined by the smallest of detail. And yet again, I find myself at a loss of words to describe the stunning aura created by the exquisite music you’ll hear in KKC’s very wealthy score. As promised, 2007 has been adorned by musical art that has surely etched its place in history. 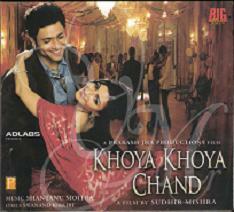 From the groovy numbers of Khoya Khoya Chand to the youthfully romantic tracks of Om Shanti Om. From the soul-soothing recreations in Awarapan to the unconventionally sultry sounds of Dharm. From the innocently playful tunes of Life In A…Metro to the far-reaching echoes of Khoya Khoya Chand – we have truly heard it all, and have been blessed with a wide-array of depth, breadth, and diversity once again.